My first day in Prague is now a little hazy. It was hot and I was jetlagged. 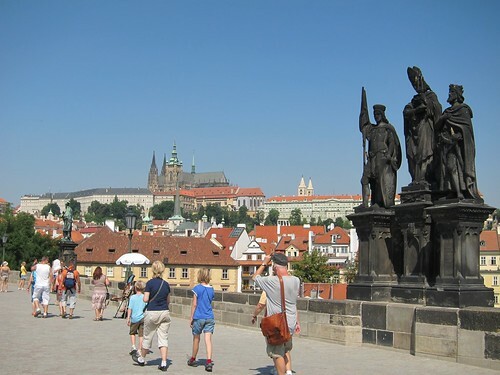 But I had all day to explore Old Town Square, the Charles Bridge, and Prague Castle, which is more of a massive complex than our modern concept of a castle as a fortress. 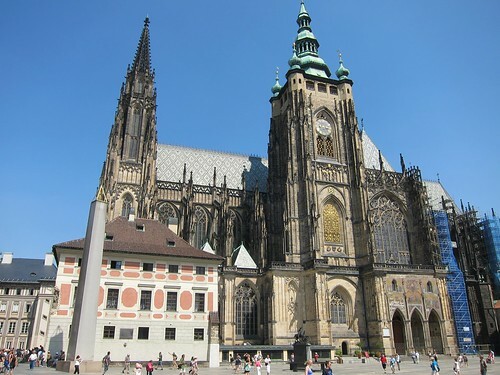 At its center is St. Vitus's Cathedral, which is visible from the bridge and just about any point on the Vltava River. I walked and walked and walked some more, to the point that whenever I sat down I felt as if I could just fall asleep right there. I took a nap at the hotel before dinner, which helped matters. But after dinner and a bit more wandering around, I returned to the hotel and slept like the dead. 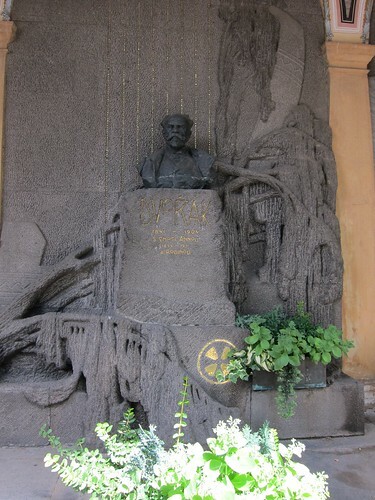 After breakfast on Saturday I set out for Vysehrad, the remains of the ancient castle on the Vltava. 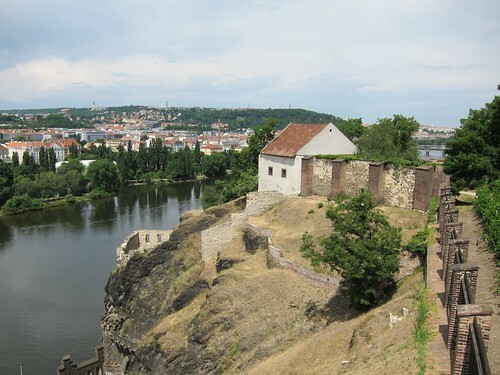 I walked along the river then hiked up the hill to the remains, which command a spectacular view of southern Prague and the neighborhoods across the Vltava. 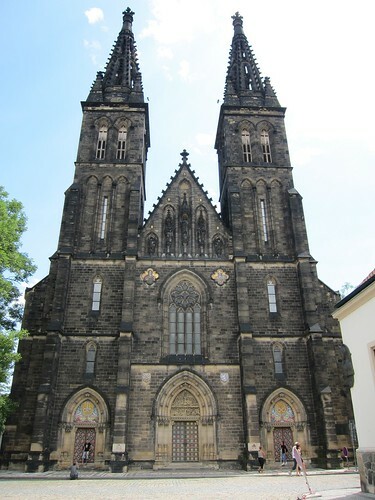 At Vysehrad I especially enjoyed the church, built and rebuilt over the centuries to its current Neo-Gothic design, and the cemetery in which Czech luminaries such as Antonin Dvorak and Bedrich Smetana are buried. Prague's National Marionette Theater is world-renowned for its production of Mozart's Don Giovanni, which originally premiered in Prague conducted by the composer. There are actually two (possibly more) productions in Prague but I found the one that claimed to be the original (with press clippings and photos of world tours to back up the claims). I suspect it might be similar to the Ray's Pizza controversy in New York. The show began with a marionette of Mozart as conductor, leading an unseen orchestra through the overture (the music is recorded). The overture went a little off the rails, with the "musicians" throwing their music out of the orchestra pit and the music speeding up and slowing down. The opera itself was a delight. All of the marionettes were manipulated expertly and well-choreographed with the music. There was a naked Don Giovanni for a bath scene and even a bit of implied marionette on marionette action during a seduction. Between scenes Mozart appeared and bumbled around, stumbling into a speaker and drinking from a tiny wine glass. During a rainstorm in a graveyard scene, he even put up an umbrella. And at the end of the opera, after Don Giovanni's demise, I'll just say that the performers tried to get their creations to end the show so we could go home, with humorous results. I returned to my hotel and packed my bags, preparing for Sunday morning's departure for the Backroads bike tour. 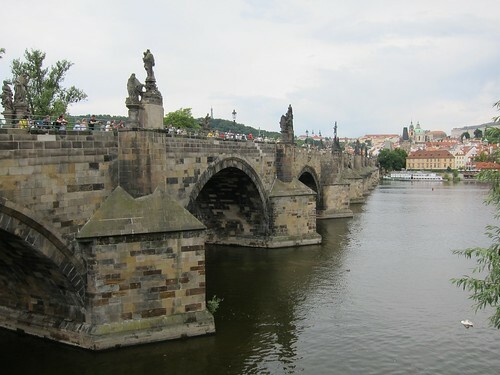 I was excited about getting to see more of the Czech Republic and to meet the people who would share the experience with me. Please check out my complete set of photos from Prague.